Screaming Eagle Aerial Adventure Park is owned and Operated by Screaming Eagle Zip Line Canopy Tours at Historic Banning Mills and is the most experienced zipline canopy tour and now the SAFER option for zip line canopy tours using a closed belay system for beginning to end. You are never disconnected from our patented safety system unless your feet are on the ground! You can rest assured that safety is our number 1 priority. We take our safety standards seriously so that you can have an amazing experience while zip lining with us! Thousands have made life long memorable and fun experiences with us since 1999. All of our ziplines, towers and other adventure trek pieces have been designed and build by American Adventure Park Systems, Historic Banning Mill's own maintenance and construction team. Screaming Eagle Adventures at Historic Banning Mills is one of the FIRST professionally installed zip line adventure courses in the United States. Owner/Operator and former Special Ops/U.S. Army Ranger, Aviator, Mike Holder, helped design and construct ziplines for mountaineering training and combat demonstration purposes at Ft. Benning, Georgia, as well as around the world. Mike's military and zip line expertise has aided in the success of Screaming Eagle Adventures at Historic Banning Mills. All of our courses, as well as other we build, are professionally designed, constructed, installed, inspected and maintained. We now bring this professionalism to Amicalola Zipline Aerial Adventures. Our Canopy Tour Guides are trained extensively to best ensure your safety, well being and FUN on our zip line canopy tours. All Guides are CPR and Wilderness First Responder trained. Guides at Screaming Eagle Aerial Adventure Park are also trained in High Rescue Techniques. Our Guides are required to have 60 hours of training quarterly on Wilderness First Aid refresher, hands on High Rescue procedures and refresher, review policy and procedures. If you are interested in joining the zipline, aerial adventure or adventure business, American Adventure Park Systems at Historic Banning Mills can help! We design and build world class aerial tours. 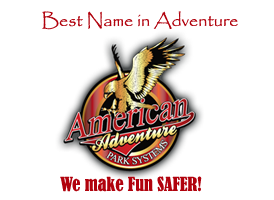 American Adventure Park Systems (AAPS) design and build WORLD CLASS zip line canopy tours, aerial adventure courses and aerial tours. AAPS also offers training for zip line canopy tour Guides. AAPS' workshops train guides in Advanced High Rescue Techniques, CPR and Wilderness First Responder Certification at Historic Banning Mills, the largest most experienced course in the world. AAPS' safety equipment and harnesses can support up to 18 times our maximum participate weight limits. The cable connections are build with a four-time redundancy of full cable tensile strength and we use nothing smaller than 1/2 inch wire rope (cable) no matter how short the zip line. All courses are constructed with the QuickTrekker continuous, belay system which prevents accidental disconnects. If you would like or need information about zip line operations, safety equipment, training or construction please visit online at www.americanadventureparksystems.com or call us directly at 770-834-9149.